The club was founded in 1993 by two nice young men: Nick “Camtwister” Henrix & Jack “Fearless” Baymoore. At that time C.H. 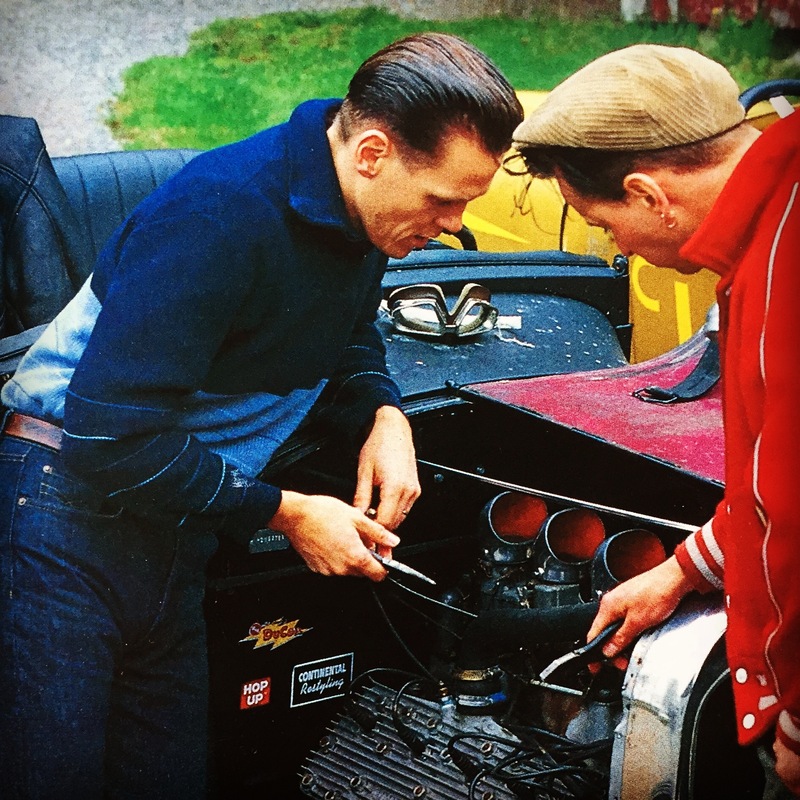 was building/driving a Ford “29 Roadster and J.B was building/driving a Harley Davidson “46 Knucklehead. They were both fascinated of the American post-WW II styling of motorcycles and hot rods and also liked the style of clubs that came out of this era. Motorcycle Clubs like Boozefighters and Red Rambler Motorcycle Club alongside of the Californian hot rod clubs. They really liked the “home-coming bomber-tailgunner” kinda style. J.B. had an “old style” racing sweater made for him. White with black arms, just like in those old pics, with Harley-Davidson on the chest and their new logo with the new-named club, A-BOMBERS, on the back. C.H. also made some cool tight t-shirts with the A-BOMBERS logo on the back. This is when the first rumbles started to echoe from the exhaustpipes of an A-Bombers member..
A few years later they started to think of organizing a meeting for people that liked the same kind of style, music and vehicles. They also hooked up ol friend Uno, who loved the style and also had some nice sets of wheels. Together they planned the first Old Style Weekend. It was supposed to be a small friendly gathering with a few people. On the Friday they just sat by the fire or sat by the beach, sipping Pina Coladas and on the Saturday there was a bigger party with about 60 people. It may be important to know that the club has no “president” or anything like that. We are just friends with common interests and just like to have a good time, party and drive our cars and bikes. See you out there ! !